Dmitri Ilyich Ulyanov (Russian: Дми́трий Ильи́ч Улья́нов) (16 August [O.S. August 4] 1874 – July 16, 1943) was a Russian physician and revolutionary, the younger brother of Aleksandr Ulyanov and Vladimir Lenin. As a medical student at Lomonosov Moscow State University, he became involved with revolutionary activity and joined the illegal Marxist Rabochiy soyuz (Workers Union"). He was first arrested in 1897. The following year he was exiled to Tula, then Podolsk, where was put under police supervision (term, equivalent to modern probation). As his brother's renown grew, he would endure countless arrests. In 1900 he became a correspondent of Iskra. The following year he graduated from the medical school of the University of Tartu. As a doctor and a Marxist, Ulyanov sought to apply his medical training to the revolutionary struggle. 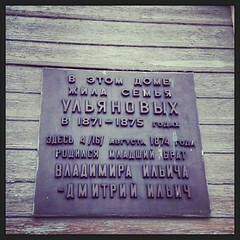 During the Revolution of 1905 he provided medical aid to strikers in Simbirsk. He became a trusted cadre of the Russian Social Democratic Workers' Party and was a delegate to its 2nd Congress. He served as the representative of the Central Committee in Kiev. His duties carried him throughout Russia and the Ukraine, first to Serpukhov, then to Feodosiya and the Crimea. At the beginning of the First World War, Ulyanov was mobilized into the army. He served as a medical officer in Sevastopol, in Odessa, and on the Romanian front, continuing his revolutionary activities on the side. In 1916 he married Antonia Ivanovna Neshcheretova (Russian: Антонина Ивановна Нещеретова). He had a son, Viktor, and a daughter, Olga. Ulyanov remained in Ukraine during the aftermath of the October Revolution and the Civil War, working to strengthen the party apparatus in the Crimea and was chairman of the short-lived Crimean Socialist Soviet Republic. In 1921 he moved to Moscow, where he worked at Narkomzdrav (People's Commissariat of Public Health), at the Communist University of the Toilers of the East, in the health research department of the Kremlin, and at the V. I. Lenin Central Museum. During the 1930s, he collaborated with his sister Maria (who was named after their mother) to write reminiscences about their famous brother, which were published in serial form. He was a delegate to the 16th and 17th Congresses of the Communist Party of the Soviet Union. He died in Gorki Leninskiye but was buried in Moscow. Many streets and localities in the former Soviet Union were renamed in his honor. В этом здании в 1905-1906 г.г. работал земским врачом революционный деятель Д.И. Ульянов.